Flying a plane may seem a priori to be a lot more difficult than driving a car, for example. In addition to the complexity of the aeronautical knowledge required to fly, this perception is also due to the fact that there are no reference points in the air, as occurs on any road. However, this is not entirely true. This infographic shows some of the basic concepts that contribute towards making air traffic one of the most regulated and safest activities. At the dawn of aviation, flights were visual. This means that their orientation was based on identifying everything that could be seen on the ground (towns, farms, rivers, coasts, mountains, etc.). Problems arose when adverse weather conditions or lack of light prevented flights from taking place, due to their making all these references invisible. Once pilots had the ability to position and orient themselves in the air using instruments, routes, rules and procedures were established that regulated in detail how to go from one point to another. All this was reflected in air navigation charts, as is still the case today. In fact, even if we can’t see them, there are well-defined paths in the sky, along with very specific flight rules, allowing aircraft to fly safely through the air. These paths are called air routes, or airways, and they are very large, with generous separations to ensure sufficient safety margins. Prior to starting a route, pilots must agree their flight plan with air traffic controllers, indicating exactly which airways they are going to use and which checkpoints they are going to cross. If everything is deemed correct, they obtain the corresponding authorisation and can initiate the flight. Subsequently, there will be a series of professionals who will verify that the aircraft stay within the authorised routes. 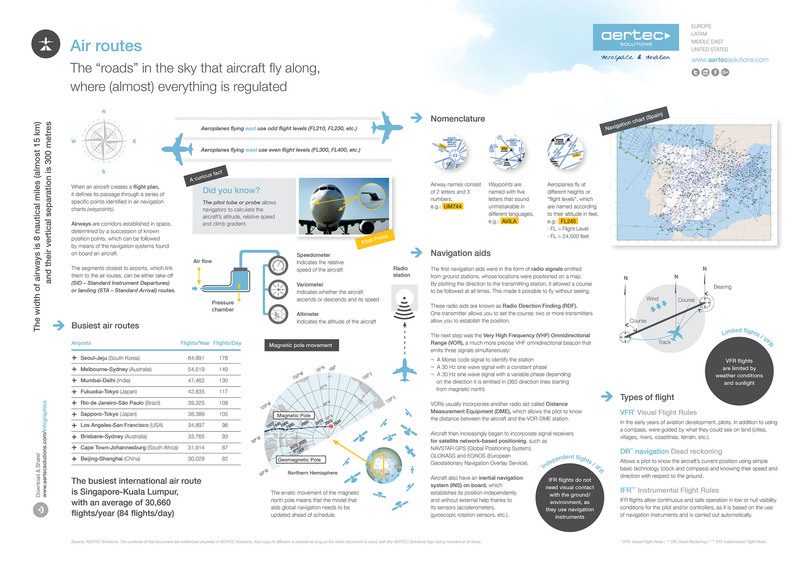 This infographic explains some of the concepts that contribute towards making flying one of the most regulated and safest activities. The contents of this document are intellectual property of AERTEC Solutions. Any copy or diffusion is allowed as long as it is integrally done to the document and preserves at all times AERTEC Solutions’ trademark.